1985-05-03. New. Ships with Tracking Number! INTERNATIONAL WORLDWIDE Shipping available. Buy with confidence, excellent customer service! Alpine Pr, 1985-06-01. Paperback. Used:Good. Alpine Pr. PAPERBACK. 0961511400 New Condition. . New. 1985-05-03. Good. Ships with Tracking Number! INTERNATIONAL WORLDWIDE Shipping available. May not contain Access Codes or Supplements. May be ex-library. Shipping & Handling by region. Buy with confidence, excellent customer service! Alpine Press, 2007. Hardcover. Good. Disclaimer:A copy that has been read, but remains in clean condition. All pages are intact, and the cover is intact. The spine may show signs of wear. Pages can include limited notes and highlighting, and the copy can include previous owner inscriptions. At ThriftBooks, our motto is: Read More, Spend Less.Dust jacket quality is not guaranteed. Alpine Press. Hardcover. 0961511435 Item in good condition. Textbooks may not include supplemental items i.e. CDs, access codes etc... . Good. Alpine Pr. PAPERBACK. 0961511400 Like New Condition. . Fine. Alpine Pr. PAPERBACK. 0961511400 Very Good Condition. Crisp pages. Tight binding. LARGE Book. Great reading copy. Shelf wear on cover. Some rubbing wear to cover edges. - All books inspected inside and out and shipped by USPS with a tracking number! I highly suggest that you choose expedited shipping. For a small fee you get priority shipping, insurance and a padded envelope for the best protection. . Very Good. Mills, WY: Alpine Press. Paperback. 1990. 1st Edition?. 4to 352pp . Very Good with no DJ. B&W Illustrations. Inscribed by the author on dedication page. Tight, clean, unmarked copy . U.S.A.: Alpine Pr, 1990. In very good clean condition. 1990 copyright. Provies information about how to care for your horse for preventive measures and simple problems and when to call the veterinarian. Illustrations and descriptive text cover topics feeding, reproduction, injuries, eye problems, and more.. Paperback. Very Good. 8 1/2 x 11. Alpine Press, 1985-06. Paperback. Good. Alpine Pr. Soft cover. 0961511400 1St Edition, Good Condition With Hardly Any Signs Of Wear, Not A Former Library Book, Not A Remainder Or Book Club, Not Clipped, Softcover. A Handy Reference Guide With A Large Index, This Book Gives You Specific Information On What To Look For And Do When Your Horse Is Ill Or Injured. 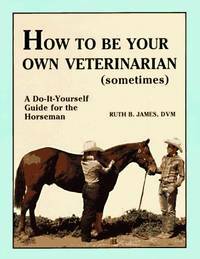 It Helps Horse Owners Treat Simple Problems Themselves And Teaches Them To Know When It Is Necessary To Call The Veterinarian. All Books Shipped Within 24 Hours With U.S. Postal Service Delivery Confirmation, Each Order Is Packaged In A New Box With Bubble Wrap, And Always Your Satisfaction Is Guaranteed. . Good. 1985. 1st Edition. Mills, Wyoming: Alpine Pr, 1985. Reprint. Paperback. Very Good. 4to - over 9¾" - 12" tall. Clean, tight VG copy. Light use wear to wraps. Alpine Press, May 1985. Paper Back. Acceptable. Alpine Pr, 1985-06-01. Paperback. Good. Alpine Pr, 1985 Very good to like new softcover,81/2 by 11 inches,352 pages,very usefull and informative book,selling books for over 20 years,100% refund,#9394. Book. Paperback. Very Good. Alpine Press. Used - Good. Shows some signs of wear, and may have some markings on the inside. Alpine Press. Used - Good. Ships from Reno, NV. Shows some signs of wear, and may have some markings on the inside. 100% Money Back Guarantee. Shipped to over one million happy customers. Your purchase benefits world literacy! Alpine Pr. PAPERBACK. 0961511400 Clean, has a good binding, no marks or notations. . Good. Alpine Pr. PAPERBACK. 0961511400 Good, clean text, paperback binding, light to moderate wear to corners and edges, may have previous owner's signature, remainder mark, sticker/residue, and/or other minor aesthetic flaws. Satisfaction guaranteed. Last Word Books & Press is an Infamous Independent Bookstore and Print Shop located in Olympia, Washington. . Good. Alpine Pr, 1985. Paperback. Very Good. Disclaimer:A copy that has been read, but remains in excellent condition. Pages are intact and are not marred by notes or highlighting, but may contain a neat previous owner name. The spine remains undamaged. At ThriftBooks, our motto is: Read More, Spend Less.Dust jacket quality is not guaranteed. Alpine Pr, 1985. Paperback. As New. Disclaimer:An apparently unread copy in perfect condition. Dust cover is intact; pages are clean and are not marred by notes or folds of any kind. At ThriftBooks, our motto is: Read More, Spend Less.Dust jacket quality is not guaranteed. Alpine Pr, 1985. Paperback. Acceptable. Disclaimer:A readable copy. All pages are intact, and the cover is intact. Pages can include considerable notes-in pen or highlighter-but the notes cannot obscure the text. At ThriftBooks, our motto is: Read More, Spend Less.Dust jacket quality is not guaranteed. Alpine Pr, 1985. Wraps have light wear. Pages clean with no markings in text. . Soft Cover. Good. 4to - over 9¾" - 12" tall. Alpine Pr. PAPERBACK. 0961511400 Has some shelf wear, highlighting, underlining and/or writing. Great used condition. A portion of your purchase of this book will be donated to non-profit organizations. Over 1,000,000 satisfied customers since 1997! We ship daily M-F. Choose expedited shipping (if available) for much faster delivery. Delivery confirmation on all US orders. . Very Good. Alpine Pr. PAPERBACK. B014ICKUFA Very Good Condition. Five star seller - Buy with confidence! . Very Good. Alpine Pr. PAPERBACK. B014ICKUFA Good Condition. A few pages have staining. Five star seller - Buy with confidence! . Good. Alpine Pr. Paperback. GOOD. Spine creases, wear to binding and pages from reading. May contain limited notes, underlining or highlighting that does affect the text. Possible ex library copy, thatâll have the markings and stickers associated from the library. Accessories such as CD, codes, toys, may not be included.